Gov. 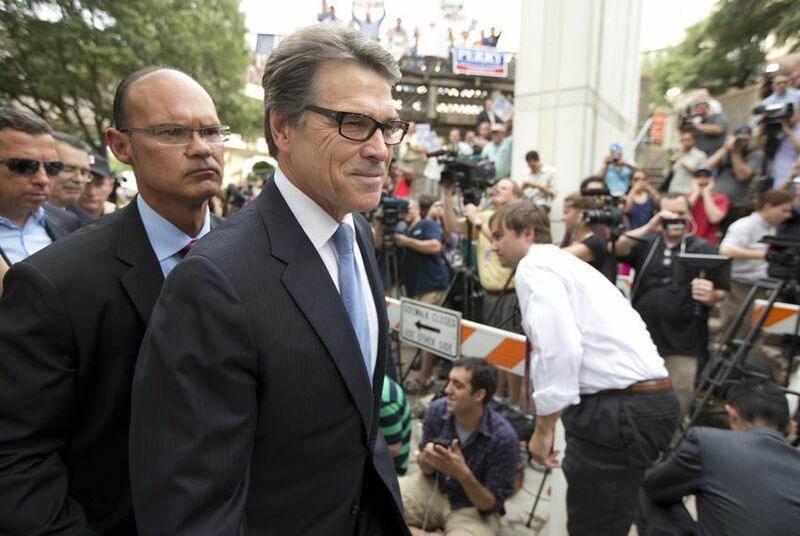 Rick Perry’s lawyers have filed a second challenge to the governor’s indictment on Monday, asking a judge to dismiss the charges against him as unconstitutional. Gov. Rick Perry’s lawyers have filed a second challenge to the governor’s indictment on Monday, asking a judge to dismiss the charges against him on the grounds that the charges are unconstitutional. Perry was indicted last month on charges he coerced a public servant and abused his official capacity of governor when he threatened to veto $7.5 million in state funds to the Travis County district attorney's office if District Attorney Rosemary Lehmberg refused to step down after her April 2013 drunken driving arrest. Although the new filing bears some of the same arguments offered in a writ of habeas corpus filed a week ago by Perry’s defense team, lawyers observing the case say there’s a reason to file both. In effect, the lawyers are asking the judge to toss the indictments no matter how he rules on the court's authority to proceed. There is no deadline yet as to when the special prosecutor in this case, Mike McCrum, will file his responses to the defense team’s challenges. However, while both challenges — the motion to quash and the habeas writ — may make the same arguments, but the order in which Visiting Judge Bert Richardson considers them could make a big difference in the pace of the proceedings. "We hope the court will consider them both at the same time," Buzbee said. "The grounds are essentially the same but this filing gives the court the ability to dismiss completely both counts of the indictment if he feels some issues are better addressed via a dismissal motion rather than a writ." “The danger of filing the writ here is the losing party will appeal, and that is going to slow matters to a grinding halt for a while,” Hilder said, adding that all action in the trial court would stop until the appeals court makes its ruling on the writ. The next court date in the case, Oct. 13, is expected to be more of a sort of check in between McCrum and the Perry lawyers with Visiting Judge Bert Richardson. Perry is not expected to appear. Editor's note: An earlier version of this story indicated that a motion to quash could not be appealed. It cannot be appealed by the defense.